Major confession: I’m not a huge fan of pumpkin pie. I love pumpkin but sometimes pumpkin pie can be just too…much. Can you forgive me? However, I think I finally figured out a way that I love pumpkin pie: in bar form! These Pumpkin Pie Bars with pecan crumble have the perfect amount of crust to filling ratio. Anti-Pumpkin Pie people everywhere will change their tune…I promise! Growing up, my mom was famous for her pies. Every Thanksgiving and Christmas, she always brought dessert and dessert was always a pecan pie and a pumpkin pie. There was never any discussion about if she would bring pie. It was how many she would bring. The travesty in all that was that, as a kid, I didn’t really like either pumpkin or pecan pie. This meant I spent many Thanksgiving evenings with a plate of whipped cream. My problem with pumpkin pie was not in the flavor, but the texture. That is precisely why these bars are perfect for me – and those like me. The crust:filling:topping ratio makes the texture of the filling perfect. Which is why I needed to immediately freeze these after I ate the one in the photos. The other thing that these bars have going for them? That they’re bars. 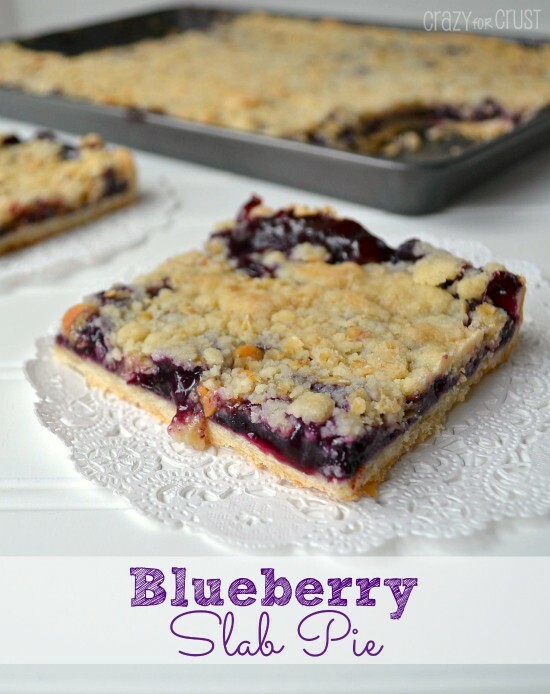 I love pie (a lot, obvi) but you have to admit: pie bars just easier than a whole pie. One, they’re easier to cut. Two, they’re easier to serve. And three, they’re easier to give away. 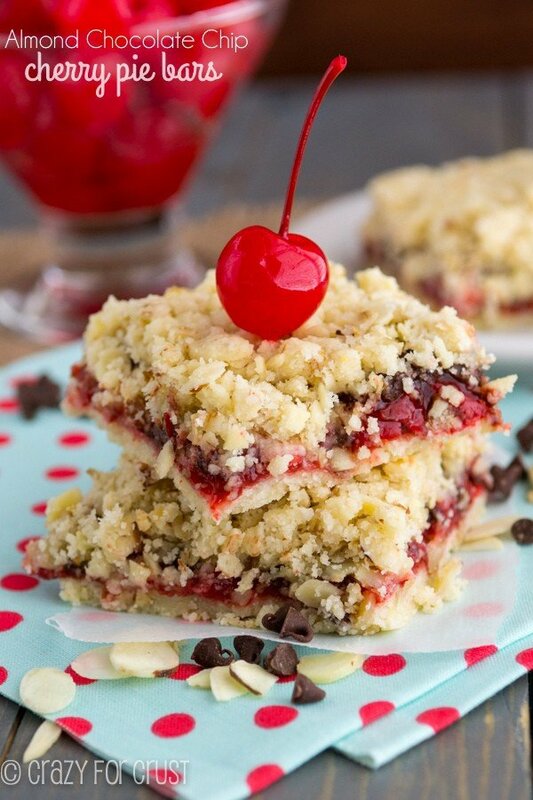 Plus, pie bars have more crust and crumble together than filling. Um, that’s my kind of pie. Okay, so let’s break down this recipe. The crust is a shortbread one, made with butter, sugar, and flour. It’s very crumbly when it’s mixed, but it presses together well in the bottom of your pan. The filling is a variation on my mom’s pumpkin pie. I’ve been trying to figure out how to make the filling in her a little smoother (to satisfy my texture issues). Instead of using whole milk and 3 eggs, I used evaporated milk and 2 eggs. The result? The texture is perfect. And if shortbread crust + pumpkin filling wasn’t enough, these bars needed a crumble. I’ve often said, give me a pie with crust and crumble and I’m good – no filling needed. This crumble is made with butter, flour, sugar, cinnamon and pecans. It’s chunky and since the pumpkin is very liquidy, you just sprinkle it over the top. The crumble adds some sweetness and a satisfying crunch from the pecans. These are, in a word, perfect. 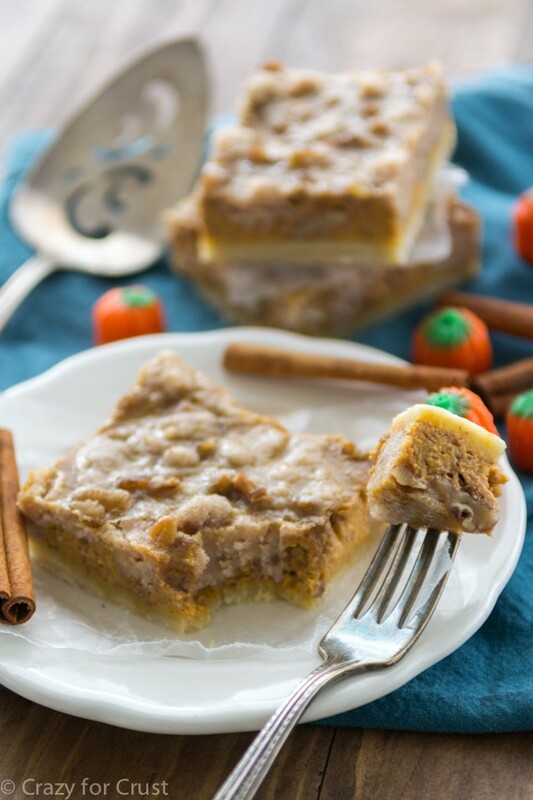 Perfect Pumpkin Pie Bars. I’m totally making these again for Thanksgivng. Because those ones in the freezer? Like a pumpkin pie...but in bar form! 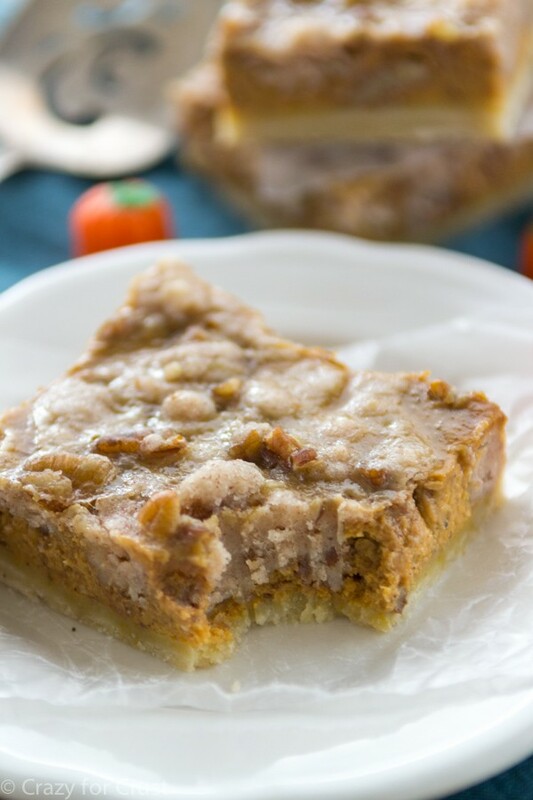 The pumpkin is smooth and rich on top the shortbread crust and the topping is sweet and crunchy from pecans! Make the crust: add butter, flour, and sugar to a large bowl. Mix with a stand or a hand mixer until it becomes crumbly. (You may need to use your fingers to break up any larger chunks of butter.) Press into the bottom of the prepared pan. Bake for 15 minutes. While the crust is baking, prepare the filling and topping. Make the filling: Whisk pumpkin, evaporated milk, salt, and eggs in a large bowl. Whisk in brown sugar and spices. Set aside. Make the topping: add all topping ingredients except pecans to the large bowl you used for the crust and mix with a hand mixer until crumbly, (again you may need to use your fingers to break up any large chunks of butter). The mixture will be crumbly/chunky. Stir in pecans. Set aside. After 15 minutes, remove crust from the oven. Whisk the filling once more, then pour over crust carefully and slowly. Sprinkle topping evenly on top of filling. Bake for an additional 25-30 minutes, until topping looks set (mine took 30 minutes).Cool at room temperature and then refrigerate for at least 2 hours or overnight before cutting into squares. Store covered in refrigerator for up to 3 days or freeze in airtight bags for up to 1 month. Pinned 🙂 Thanks for the recipe! Thanks for the pin Janet!! oh yum!! these look amazing! pinning! Okay so I am going to make these! I love pumpkin! But I love all of your other bars listed too!!!! I want to try those cherry chocolate ones! I can’t wait for your cookbook! But then I haven’t not loved anything you have made! You are a dangerous friend to know and love! I agree with you about pumpkin pie! I love all other things pumpkin though! I don’t like pumpkin pie because of the texture though, not the flavor. 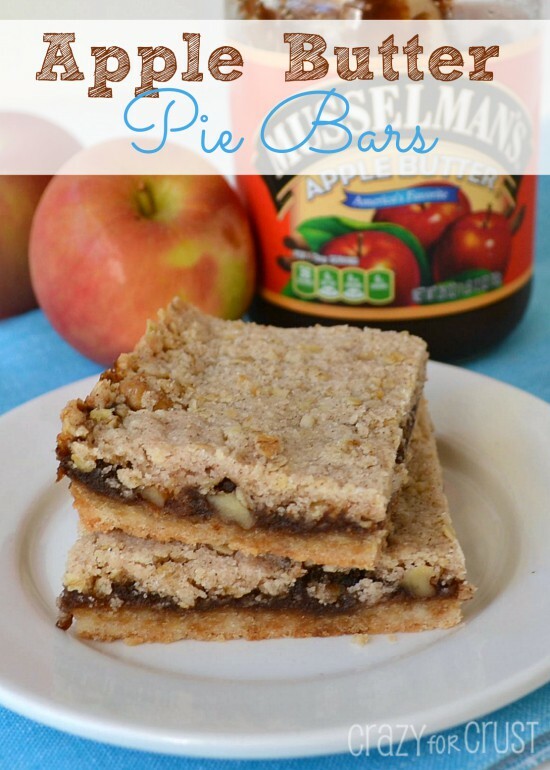 Oh my goodness – while I love pumpkin pie, I think I’ll have a side of these bars with my pie! They look amazing! That topping is calling my name!! 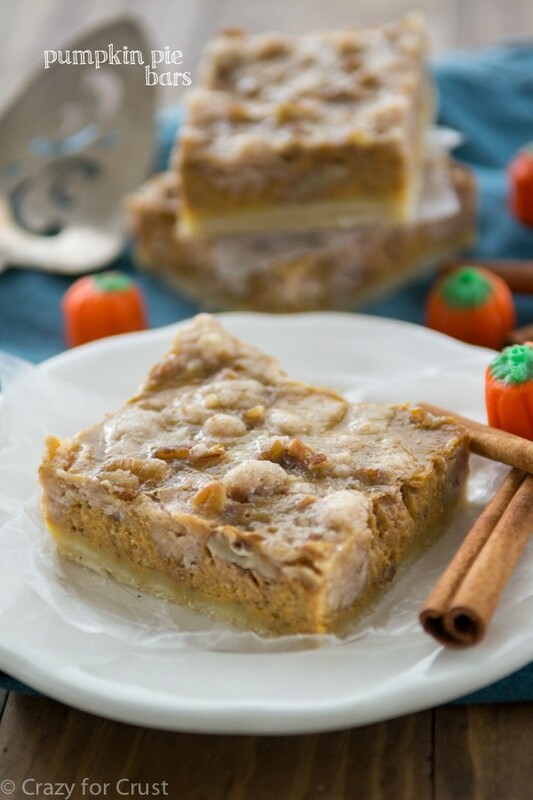 Love the Pumpkin Pie Bars with Pecan Crumble!! Delicious! They are easy to make and freeze. I just have to take out a bar or 2 out of the freezer each day to have with my coffee! Fall of the year and this is the perfect treat!! Thanks Nancy! I’m so glad you liked them! Mine came out just like the photo, and I was so excited! But overall it’s not sweet enough for me. I think I need to add more brown and white sugar to the topping, and definitely more salt, because I used unsalted butter. The spices are mild, which is ok, but I might increase the amounts, more like the old Libby pumpkin can label recipe. The bottom crust is very easy, I used an old fashioned pastry blender and had no lumps. Also used cold butter and it made a nice crumb. Salt and spices are definitely things everyone has preferences for! If you’re someone who loves a spicier pumpkin spice flavor, by all means add more! I was going off how my mom has made our pumpkin pie for years. 🙂 And sugar, well. Add ice cream! Ha! Hi – just wanted to let you know that I used your pie crust recipe again for the base of a pumpkin pie with a different filling (no evaporated milk, which turns out to be really bad for us with lactose intolerance. Anyway, the crust works really well in a pie pan – I just dumped the crumbled mix into the plate after lightly buttering it, then used the back of a big spoon to press the dough down and up the sides of the pan. with practice I can probably get it more even. DELICIOUS CRUST! Makes the pie perfect! Dorothy – these are amazing, especially to those of us in my family who are not big fans of traditional pumpkin pie. I used my food processor for the crust (cold butter) and it came together in about 10 pulses. I did the same for the crumble before adding the pecans. Quick prep!